Heat 4 cups of oil in deep dish non stick pan for pakoras. In a bowl add 2 tbsp of besan with 1 green chili chopped. Add ½ tsp of red chili powder and ¼ tsp of turmeric powder. Add 2 tbsp of youghurt. Add cumin seeds, ajwain, coriander powder, ginger and asafetida and salt. Mix it well till it turns to thick batter for pakoras. Drop the pakoras one by one when the oil is hot and cook all of them. Keep the pakoras on tissue paper or kitchen towel for excess oil to drain. In another bowl add Butter milk and rest of the besan. Add ¼ tsp of turmeric powder and salt and mix it well. In a non stick pan add 2 tbsp of oil and add the butter milk mixture. Cook till it turns little thick. Now in a non stick pan prepare the tadka. Add 1 ½ tbsp of clarified butter or vegetable oil and add ½ tsp of red chili powder and curry leaves and green chilies and sauté them. 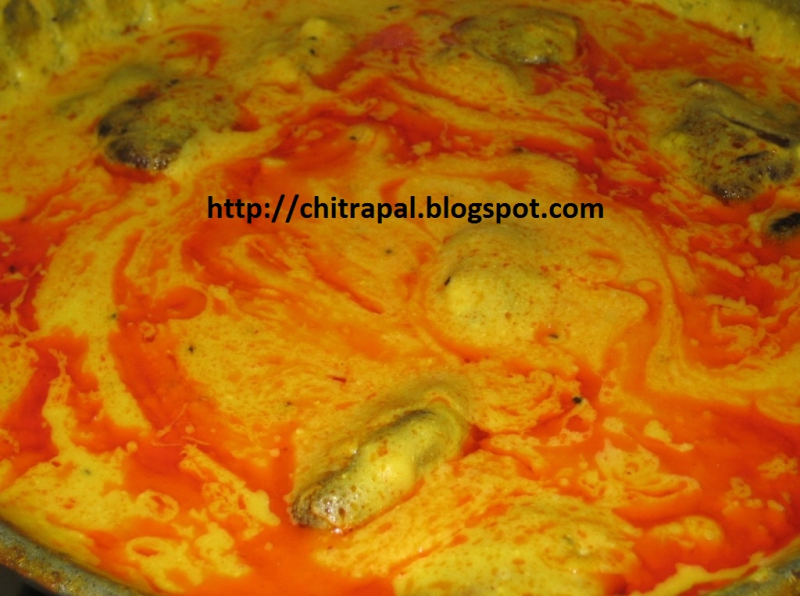 Pour the tadka to kadhi and add pakoras to it. Serve hot with steamed Rice or zeera rice or paranthas. This is superb Chitra I really love it. Thank you. Really even my mom in law cooks with methi dana and corriander seeds tadka. I have tried that way it comes out different but tasty.